Thank you for supporting the Grosse Pointe South Football program. Your $25 purchase price goes directly to the football program and players. 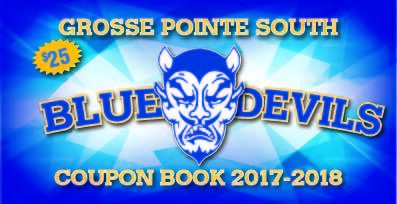 This year's Coupon Book is better than ever! Thousands of dollars in savings to businesses you use every day, and some great new places to try! The 2019-2020 edition will be out in August. See your favorite Blue Devil football player or click here and we will contact you as soon as they are available! Thank you and go Blue Devils!